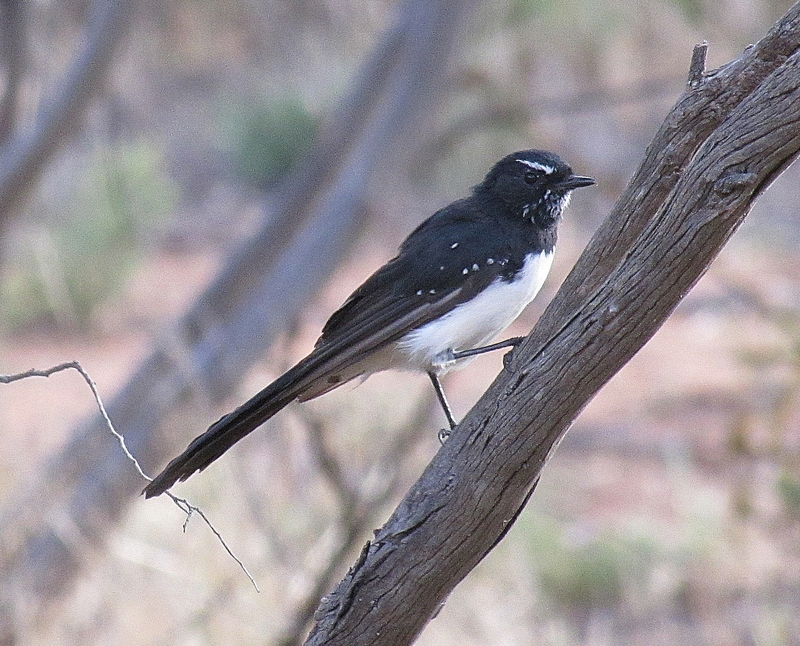 One of the most recognisable Australian birds would be the Willie Wagtail (see photo above). It is also one our most endearing birds, a favourite of many people. It loves occupying spaces close to human habitation, especially our gardens. We have a resident pair in our garden and we see them on a daily basis. 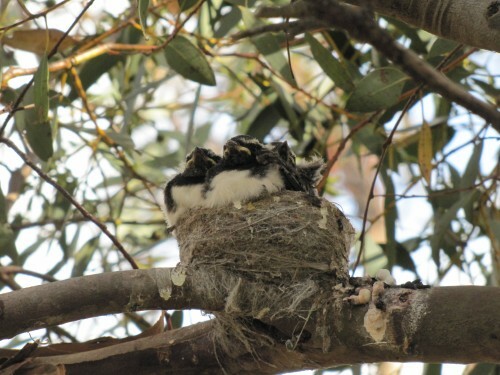 Australian Magpies: our resident Magpies must be nesting somewhere on our five acre property here in South Australia. The male is consistently chasing almost every bird which comes near. Fortunately us humans are never swooped. Last Saturday, however, the roles were reversed. It was the magpie being chased – by a very aggressive and angry Willie Wagtail snapping at its tail as it tried to escape its wrath. Little Ravens: We often have small flocks of Little Ravens in our garden, usually up to about six or so. Yesterday I heard and then saw three ravens in the large mallee trees at the back of our home. As usual, they were cawing loudly. This attracted the attention of the Willie wagtail who rapidly came into the situation and began snapping at a raven’s feathers, tail and head, harassing the poor bird mercilessly. As soon as one raven flew off with a few caws in protest, the Willie Wagtail would turn its attention to another until all three were well and truly seen off the property. I have only observed Australia’s largest bird of prey, the Wedge-tailed Eagle, on one occasion here in over 30 years. It is, however, quite a common bird throughout this part of the country and I have seen the species on many occasions in my travels. It always amazes when the tiny Willie Wagtail – not much bigger than a humble House Sparrow – aggressively attacking the eagle, snapping at it and even pecking at its back while hitching a ride. Such courage – one snap of the eagle’s beak would dismiss the wagtail permanently. 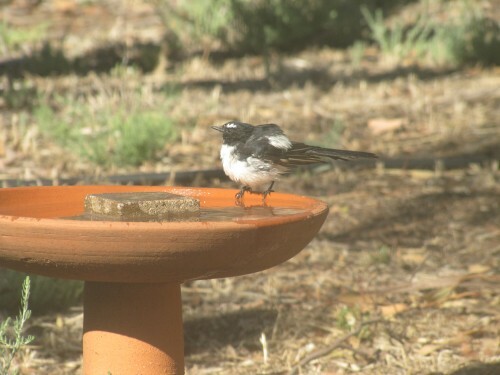 Normally the Willie Wagtails are friendly, docile birds. They will allow all manner of birds to cohabit happily in our garden. The reason for this sudden change of attitude is a simple little nest, like the one shown below. The photo below was taken a few years ago because I don’t want to disturb the mother Willie wagtail. She is currently sitting on two lovely eggs. She is not even afraid to come after me when I get near to the nest, snapping near my head until I move a reasonable distance from the nest. The weeds near the nest will just have to wait a few weeks to be mown. Sigh. I recently wrote about other birds nesting in our garden (click here). 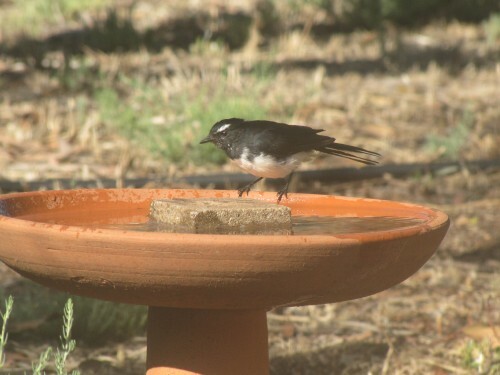 We get a great deal of pleasure from watching the constant parade of birds coming to our birdbath. This Willie Wagtail was really getting into the art of having a really good soaking. It is also situated strategically for great photo opportunities too. Have the babies flown the nest? We have a pair of Willie Wagtails who live in our garden. They often come very close to us as we work in the garden, especially when we are weeding or digging the garden beds. They are quite unafraid of us. Every year they build a nest somewhere near the house. Quite often they will even have a second brood of young ones. This year I noticed them building a nest a few days before we went to Sydney for just over two weeks. I checked on our return and one of the adults was sitting on the nest; I didn’t know if there were eggs or chicks in the nest and didn’t want to disturb the parent bird. Now two weeks later and the nest is empty – in fact, it’s on the ground. Enough time has elapsed for the eggs to have hatched and the young to have flown. Strange then that we haven’t seen the little ones begging to be fed. I suspect that the nest may have been raided by some form of predator: raven, magpie, currawong, falcon – even a stray cat that has been lurking in the vicinity. All I can hope is that they decide to nest again – in a more secure location. Sometimes it is the common species that give birders the most problems. With me it is getting good photos of the common garden bird, the Grey Fantail. This bird has been visiting our garden in recent weeks. It is a regular visitor during the cooler months. I haven’t been able to get a good close up photo until earlier this week. I chased it around the garden on several occasions over the previous week, only to have it elude me and my camera every time. They are not known to sit still for very long. 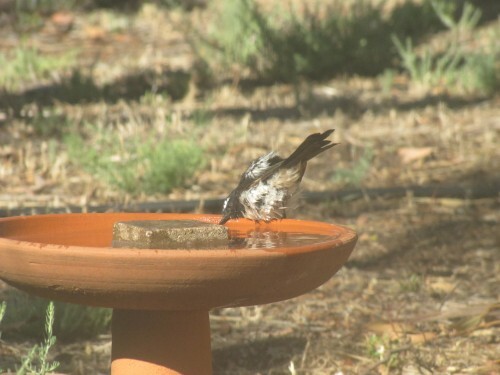 Eventually, it settled on the bird bath for long enough for a photo. It then returned several times over the next few minutes; I was waiting with my camera ready focussed. The Abyssinian Slaty-flycatcher (Melaenornis chocolatinus) has caused me some frustrating research time. The illustration in my field guide is small and not easy to tell if I’ve got this nailed down right. I’m going to assume I’ve got the right ID until a more experienced and knowledgeable reader tells me otherwise. Oh, the joys of birding in an unfamiliar country with no human guides to point out the error of one’s ways. These photos were taken in the grounds of the school where my daughter was teaching last year in the heart of Addis Ababa, Ethiopia. It was quiet and sat still for a minute or two before swooping down to catch an insect. It then returned to the perch shown in the photo. Abyssinian Slaty-flycatchers are found on the edges of forests at an altitude between 1000 and 3250m. While this was taken in suburban Addis Ababa, there were small forest patches nearby, including several acres of eucalyptus in the school campus. You are currently browsing the archives for the Flycatchers category.